Is that an "A"? That is rubbish. I like these for the most part. Clean lines, draw strings, no weird modern piping and such. The black shoulder yolk throws it off a little, and the flaming "C" crammed under the script looks like an afterthought. Needs more yellow somehow. A couple minor tweaks and these are beauts IMO. Seeing the Flames in action tonight, the new sweaters look good, but the shorts... not too keen on the double stripe action. IMO the sweater on its own is alright. It's definitely one of the nicer looks to emerge this year. 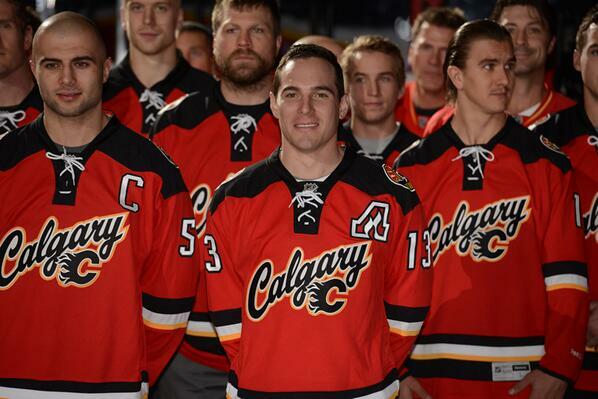 My only real gripe with them is that Calgary ditched their iconic throwbacks in favour of them. Those uniforms are absolutely gorgeous. I'm assuming they didn't want to fully embrace their vintage look so it wouldn't seem as if they're ripping off Edmonton but damn, they're missing out. The Pens have that stupid half stripe on their Stadium jerseys too. So terrible. Watched the Boston/Calgary game the other night. From a distance the Flames look like the Hurricanes in those 3rd jerseys. Hideous. Pens jersey is OK but rather boring. Also has the arm stripes that stop half way around. I don't care for any of the chrome get ups, but of the one's I've seen so far this Pens jersey is the best. The logo works well and the simple colors downplay some of the features that stand out on other jerseys. Overall it looks pretty clean. Best feature of the jersey is the model. Essentially, it's their old third uniform with the awkward chrome logo and bizarre zig-zag striping. The Hawks-Pens game isn't gonna look too bad, easily the best two sets to come from all this Stadium Series stuff. The Hartford Wolfpack also unveiled their uniforms recently. They get points for avoiding the chrome logo monstrosity but somehow will skate away looking more futuristic than any other participating team. No word on when New Jersey's new jersey will come out but we all know how New Jersey feels about new jerseys. Rumour has it that New Jersey's new jersey will actually be an old New Jersey jersey with new jersey modifications (or simply put, a chromed out logo on their Saint Patty's Day jerseys).